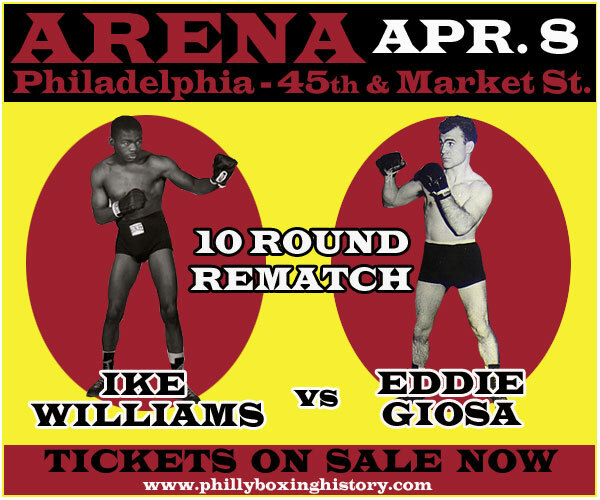 On this day in 1946, Ike Williams knocked out Eddie Giosa in round one of their 10-round rematch at the Philadelphia Arena. Eddie & Ike has squared off just one month prior. In that first bout Giosa was leading on the scorecards when Williams landed a knockout blow just a fraction after the bell ending the fourth. Controversy and protest ensued, but the decision stood - KO4 for Williams. A rematch was the natural move. In the rematch, it was all Williams, then the NBA Lightweight Champion. Giosa rushed out toward Williams to open the first round. He was aggressive and looking to take the lead, as he had done in their first meeting. But a devastating left hook from Ike dropped Eddie to the canvas hard. Giosa got up at the eight count and rushed Williams again. But a poker-straight right hand deposited Giosa on the floor once again. Proving his toughness, Giosa rose somehow. With Giosa on shaky legs, Williams swooped in to finish it. Another hard right landed and Giosa stumbled back and went down again. This time he was out cold. However, the bell sounded to end the round. Giosa's corner ran in and dragged him to the stool - his heels raking the canvas the whole way back. So unconscious was Eddie, that he kept falling sideways from his sitting position. The fight was stopped before the bell for the second. There was no third match.